Los Angeles, CA (2/1/19) – Since the mayors of Boston and Los Angeles have respectfully declined to make a friendly inter-city wager on the Super Bowl outcome, Society for the Prevention of Cruelty to Animals Los Angeles (spcaLA) President, Madeline Bernstein is taking up the mantle. Bernstein and Massachusetts SPCA (MSPCA-Angell) President, Luke Carter are betting on their home team to win the Super Bowl on Sunday. The presidents issued their challenges in video form on social media today. 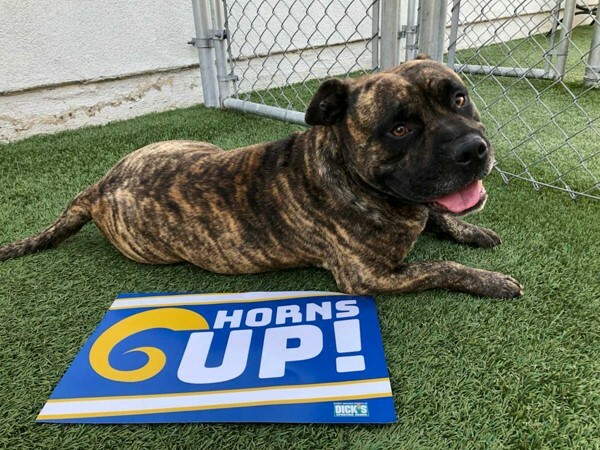 If the Los Angeles Rams win the Super Bowl, Carter will send treats to the spcaLA shelter dogs. If the New England Patriots win, spcaLA will send toys to the Massachusetts dogs. “We figure their dogs haven’t developed a palate for L.A.’s artisanal, organic vegan dog treats, so toys are a safer choice,” Bernstein joked.